Today many Americans find themselves thinking: how are politicians so comfortable lying? The answer may be found in the important element of how they lie. Specifically, politicians rarely lie straightforwardly; instead, they bend the truth. Because “truth bending” is rooted in some version of the truth, it creates enough wiggle room for politicians to maintain the belief that they are good, honest people. Moral psychology shows that people lie to the extent that they can still see themselves as good people. Their wrongful or shady actions need to allow enough wiggle room such that they do not perceive themselves as bad, and truth-bending conveniently provides this flexibility. Most of the popular 2012 elections lies are examples of truth bending. When we examine this component, we can better understand why politicians feel so comfortable making false claims. Let’s take a look at two of the most popular bends. 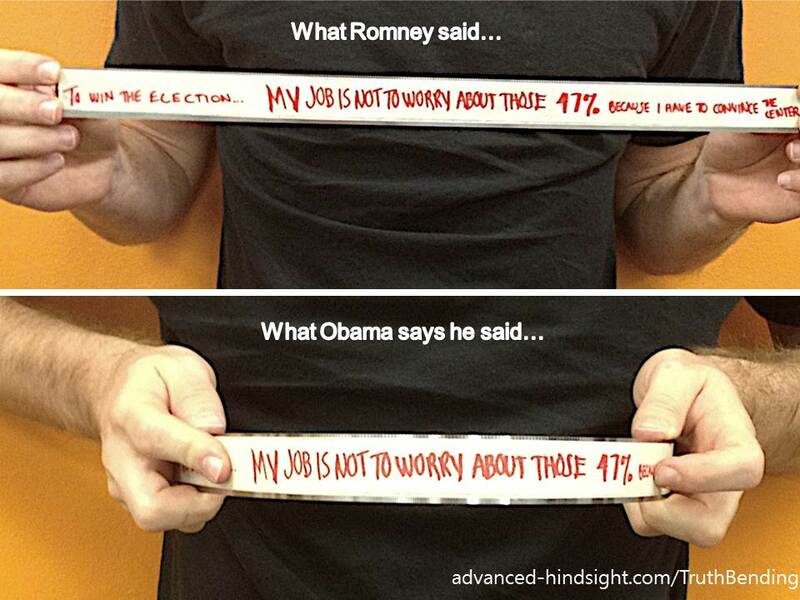 Obama for America ads use the 47% comments to say Romney doesn’t care about veterans, the elderly, and at least 47% of the country. Romney commented in a discussion of his campaign strategy, “My job is not is not to care about … the 47%.” However, he did not mean that he did not care about these people nor did he state that he does not want their lives to be improved. Instead, Romney meant that he would not focus on courting these voters because he believes that those efforts would be a waste of the Romney campaign’s time. 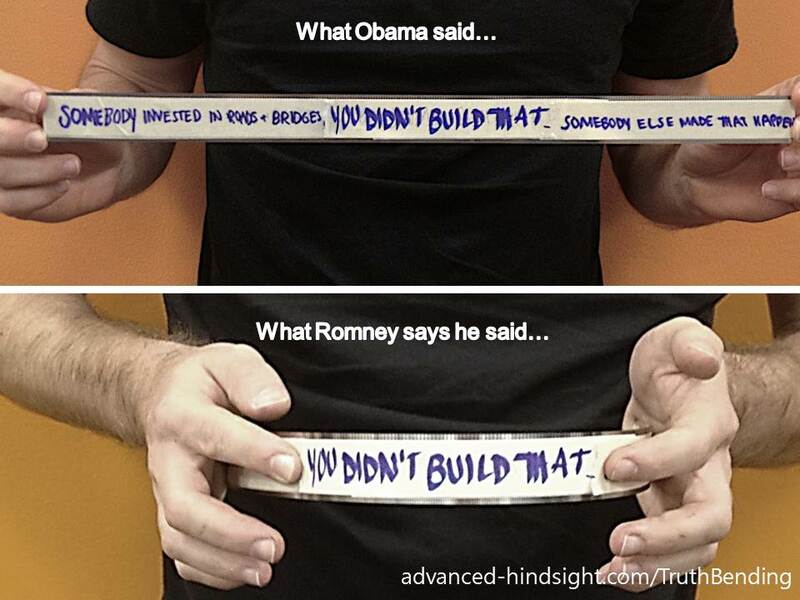 The Romney campaign publicizes the following quote from Obama: “If you’ve got a business—you didn’t build that.” This quote is used by the Romney Campaign to express that Obama does not think that businesses build themselves and instead rely completely on the government to succeed. Obama stated that, “If you were successful, somebody along the line gave you some help. There was a great teacher somewhere in your life. Somebody helped to create this unbelievable American system that we have that allowed you to thrive. Somebody invested in roads and bridges. If you’ve got a business—you didn’t build that. Somebody else made that happen.” In this quote, Obama expresses his belief that government can help create the environment that permits businesses to thrive. Obama says businesses did not build the roads that the businesses use. He does not claim people didn’t build their own businesses. Jonathan Haidt explains in The Righteous Mind that when people want to do or believe something, they ask themselves, “Can I do this?” and search for an argument to support their desired actions. Thus, when deciding whether an action is morally permissible, people have to convince themselves that it is. Without enough wiggle room, people cannot always rationalize their actions. However, as in the examples above, the combination of three factors create enough wiggle room for the campaigns to carry out such truth bending. 1. There is a bit of truth in the lie. These bends are grounded in direct quotes, or what high school students would call “primary evidence.” A politician may feel morally wrong putting words in another politician’s mouth, but taking the words that another politician said out of context may feel less wrong. 2. The essence of the message is true. Even if politicians realize they are bending the truth, technically, they may believe that they are still expressing the truth. The Obama campaign believes Romney only cares about the individuals at the top and the Romney campaign believes that Obama doesn’t care for individualism or the private sector. Their political ads may distort the truth of an isolated statement, but they also believe that the ads communicate a larger truth about the other candidate. 3. Both firmly believe they are the good guy fighting for the world. When people believe they are doing something altruistic (e.g., helping a family member), their wiggle room (and, consequently, their dishonest behavior) grows. Since politicians believe they are fighting for the good of the entire world, their wiggle room is proportionately greater. A final caveat. One view may be that politicians are intentionally lying as much as possible and only curbing their lies out of fear of media scrutiny. Though the media does play a role in curbing bends, a richer understanding of the 2012 election comes from understanding politicians as somewhat normal moral beings who are in the perfect situation to bend the truth.